Housed in a rugged plastic enclosure, the Video VBOX in-car video system is ideal for track and race use with many advanced features. 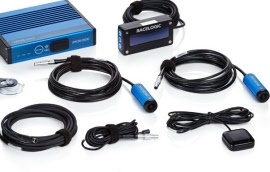 Racelogic systems have the assurance of UK based support and free training courses at the Racelogic Milton Keynes HQ. As the most widely used system in Caterham motorsport, there is readily available advice and access to benchmark hot laps within the Caterham race community. Both ourselves and all of the DPR recommended driver coaches make exclusive use of the Racelogic Video VBOX system. Our Caterham starter kit comes with all required fittings and advice for a Caterham specific installation. With this kit we offer a professional workshop based install service including providing Caterham specific scenes. If you would like us to install the VBOX you can order on line and we will contact you to arrange a suitable time for the install. 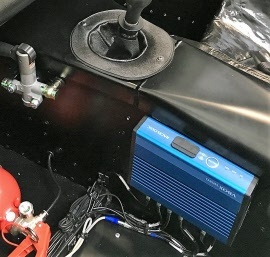 Our own Caterham bespoke kit is the 2 camera version with the OLED display with Caterham specific mounts to fit on the roll cage and a connector to fit on to the Caterham wiring loom in both the standard and new HD quality options for this system. All cameras come with a protective lens as standard. DPR Caterham bespoke kit - VBOX Lite with 2 cameras, OLED Display and all fittings for a Caterham install. DPR Caterham bespoke kit - VBOX HD2 with 2 cameras, OLED display and all fittings for a Caterham install. Price also includes protective lens. Professional workshop based install to include electrical connectors and set up of VBOX with Caterham scenes. Bright OLED screen in plastic case with billet aluminium faceplate. 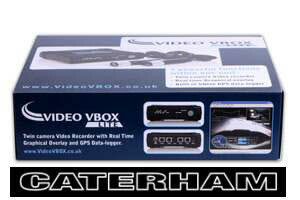 This perfect addition to any Video VBOX set up allows you to view lap times including predictive lap timing as you drive. The display is sunlight readable and all of the displayed units are configurable. The VBOX predictive lap timing is based on GPS position rather than distance and provides constant timing feedback during the lap. Full features include: Conventional lap times, predictive lap times, split times, speed G-force and Video VBOX scene selection.